Old Man Winter has got a firm grip on Connecticut right now. Kayak fishing isn’t really much of an option unless you’re really willing to brave the elements and you can find some open water. Obviously travelling south to find warmer water is always on the table, but most of our TBO Fishing Team is currently stuck here in New England (you know, those pesky jobs). Andrew, at Fishin Factory 3 in Middletown, reports that ice fishing has been going strong for the past few weeks, despite last week’s rain. The rain blew out the river and temporarily put a halt to ice fishing at some lakes that have a strong river influence, but everything is settling down and the majority of the lakes and ponds are good to go. Results from the coves were good for both pike and panfish before the rain, and should be fishing again at some point next week after it recedes a bit more. Pike and bass reports have been good from Winchester and good at time from Bantam. Candlewood is now safe in many spots and the smallmouth and perch action has been exceptional, with some anglers reporting so much action they don’t even have time to get all their traps in. It looks like we will be seeing a bit of a warming trend next week, and that should allow for some good trout action on the Farmington, as that water has now receded quite a bit. Joe, at Rivers End in Old Saybrook, told me that the recent rains have put a bit of a halt on local ice fishing, with the river being blown out and places like Mansfield Hollow taking a beating. Luckily, the water is now receding quickly, and some cold has set in. The river coves may not be ready this weekend, but most of the landlocked lakes and ponds should be good to go. There are still a few regulars heading to the Housatonic for holdovers on the warmer nights, and next week’s forecast looks conducive to some good holdover action. The shop will be announcing the date for its annual Surf Day in March shortly, so be sure to keep an eye on their website or Facebook page. Rich, at Fisherman’s World in Norwalk, reports that the recent cold snap has pretty much put an end to the local herring fishery and has slowed things down in the holdover bass game. The Housatonic has a good deal of sheet ice floating around, but should fire back up nicely next week, with some mid-50 degree days on the way. The local rivers and streams have settled down and anglers targeting trout have been finding success on the Norwalk, Mianus and Saugatuck Rivers. 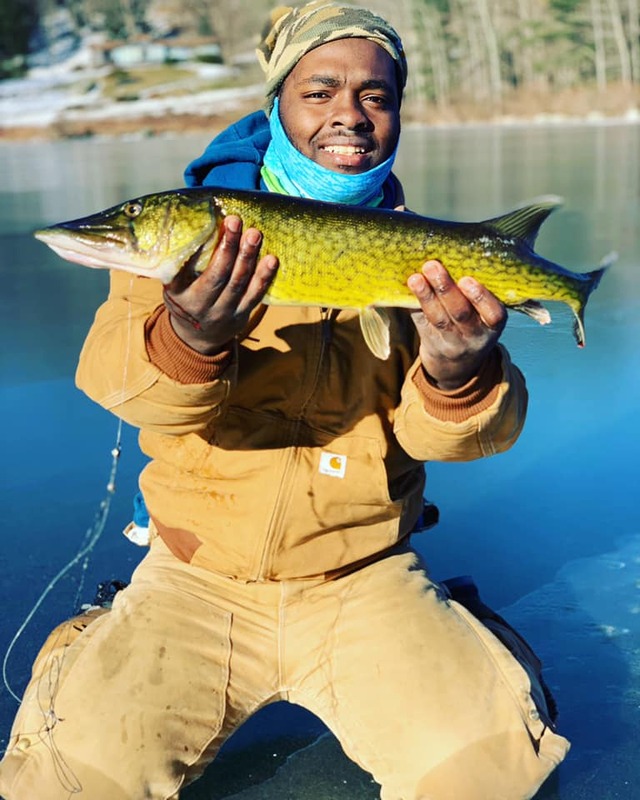 Lakes and ponds around the coastline have questionable ice, outside of the small ones, but anglers heading north to the Litchfield County area are finding good ice and good action. Torrey, at Upcountry Sportfishing in New Hartford, reported that flows continue to improve, and while they remain high, they are still plenty fishable. We are likely building some shelf ice in the latter part of this week, but temps get back to normal for the weekend and are actually quite mild next week. Water clarity has improved quite a bit, so Junk Flies paired with a #16-18 nymph have been producing well. Streamers continue to be a good choice if you’re targeting bigger fish, just remember to fish them slow and deep. Fishing these streamers in softer water, away from the main current and close to the banks and structure is your best shot for a good fish. Targeting the late afternoon hours is also a strong tactic, as the water temps rise a bit and the low light around dusk often brings some big fish out of hiding.